Public Health England’s All Our Health framework is a call to action to all health and care professionals to embed prevention within their day to day practice. Through educational materials, tools and resources, All Our Health helps professionals make an even greater impact in preventing illness, protecting health and promoting wellbeing. The All Our Health e-learning sessions have been developed to provide a bite-sized introduction to the wide range of topics covered within the All Our Health framework. Within these sessions, you’ll find signposting to trusted sources of helpful evidence, guidance and support. You can dip in and out of the content as and when you need it. Currently, there are seven All Our Health e-learning sessions available covering the following topics: Adult obesity, antimicrobial resistance, best start in life, cardiovascular disease, homelessness, physical activity and social prescribing. All Our Health supports system wide priorities on prevention, including those within the NHS Long Term Plan, by providing support and practical guidance for all health and care professionals on how to embed prevention within their work, helping to reduce health inequalities, premature morbidity and mortality. 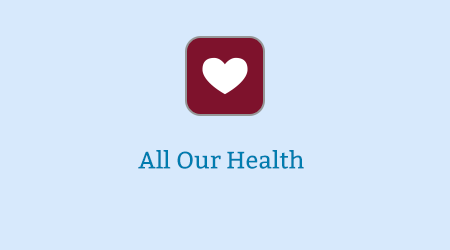 The All Our Health programme is freely available to access here. Please note your progress and completion of sessions will not be recorded and you will not be able to generate a record of completion. If you require evidence of learning, please register and then log in to access this programme on the e-LfH Hub. If you already have an account with e-LfH, then you can enrol on to the All Our Health programme by logging in to the e-LfH Hub, selecting My Account > Enrolment and selecting the programme. You can then access the programme immediately in the My e-Learning section.